This Chandan De-Tan Kid's Body Wash is without any synthetic perfumes, colour or chemicals of any sort. It is blended with natural & mild cleansers in the form of potent herbs, to care for the skin of your child. This cleanser is a blend of flowers & herbs amongst its finest quality ingredients. The finely milled herbs provides deep cleansing, brightening the complexion by gently removing impurities & dirt, revealing beautifully polished & glowing skin. Explore the entire range of Bath Time available on Nykaa. 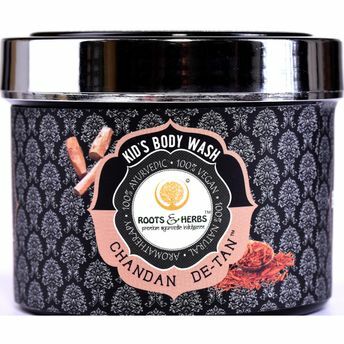 Shop more Roots & Herbs products here.You can browse through the complete world of Roots & Herbs Bath Time .